Published by Cyril Huze December 20th, 2016	in Customs, Editorial and Electrical. 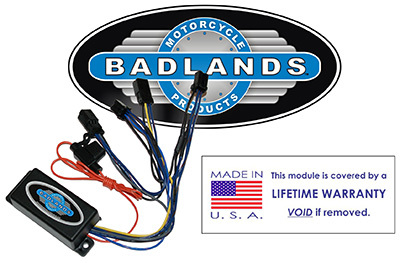 “In case you didn’t already know, Badlands Motorcycle Products has been producing motorcycle lighting modules in the USA since 1990. The company was born in a small motorcycle shop in Reno Nevada and 27-years later, Badlands is owned and operated by Pennsylvania based company, NAMZ Custom Cycle Products. Since taking over the company back in December 2013, NAMZ has made some significant changes to the Badlands line of lighting modules. What did the changes mean to you? One of the most noticeable changes was the re-engineering of each module. NAMZ spent about a year changing the platform for each module so they could speed up the manufacturing process. The new designs, now using the same mold and same circuit board helped to reduce machine time while simplifying the bill of materials and increasing our fill rates into the high 90’s. It also made for a near perfect module which already boasted a less than a 1% failure rate per 20,000 units sold! Why is it important to be Made in the USA? Badlands was founded on the basic principle of being made with pride in the USA so that is what we have continued to do. Being Made in the USA allows us to better control the engineering and manufacturing processes which gives us increased flexibility for new module designs. We continue to grow the company by producing new modules for motorcycles from Indian, Victory and late model CAN/Bus Harley Davidsons. Today, the lighting modules are still 100% USA made with pride in our Oreland Pennsylvania location. What’s new for Harley, Indian and Victory Models? The thought of no longer needing a Load Equalizer on a late model Harley is not true. All CAN/Bus models, 2011-Up Softails, 2012-Up Dyna’s and ALL 2014-Up Models using LED’s that are not compatible with the factory’s CAN/Bus BCM or Body Control Module will indeed require the use of our new CAN/Bus Load Equalizers. Because the front and rear signals are independent of each other, a separate module is required for each. If you have a newer CAN/Bus Model and you want to install 4-wire LED’s, (running light, brake light, turn signal with ground wire) our IHL-04 Modules are what you need. 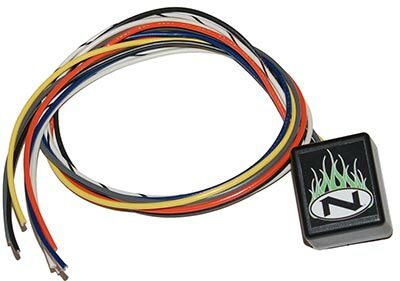 This family of modules remove the brake light feature from the left and right turn signal wire thus providing a traditional output of running light, brake light and left and turn signals. Our Indian ILL-IND-01 Module converts the factory rear turn signal and running light functions over to running light, brake light and turn signal functionality once the stock abler LED’s have been changed to our RED LED & Lens kit. Lights up the rear of all 2014-Up Indians except Scout models. The Victory models also have a few modules that convert stock rear turn signals into running lights, brake lights and turn signal functionality using our plug-n-play technology. Must change OEM Amber signals to RED LED’s or use our OEM replica versions fitted with RED LED’s, chrome or black and 100% plug-n-play for easy installation. What’s new for 2017? Badlands will have two NEW modules that offer sequential turn signal flashing for Harley, Indian and Victory. We also have NEW ATS self-canceling turn signal modules that will be cancel turn signals using speed sensing technology just like factory modules. They make a great product. Being made in the United States makes it better and the Lifetime Warranty makes it second to none. First used you guys in ’91 … Easy to use stuff for us backyard mechanics … Glad you are still here and doing well. Great USA made products, Great tech support. I wish more companies were as good as Namz. Made in America and Best made product. Thanks Jeff…. Ditto on every comment above. Been using both Badlands and Namz for years. Good stuff! American made, Decent price, 100% gurantee !! What’s not to like !! !